It's been too long since my last blog post. Many times I meant to do a write up but as many of you know, having a baby is a full time, round the clock job. So many thing fall to the wayside. I try to do at least one activity a day, whether it be a walk, a visit with a friend or an adventure. Some days we stay in and just nurse to get my supply up. Breastfeeding is a joy but also a lot of work! My little guy had a couple of weeks of not feeding very well so in order to increase my supply, I had to pump 6 times a day! That takes a lot out of a person. But now we are on track and he's gaining weight nicely. He's more of a lean and tall kind of baby, like his father. He's already fitting into 6 month sleepers! I sometimes wish I could slow down time a bit though. He's growing too fast! It's been a joy to observe his little personality come out. He's already quite musical and likes to hum to me playing the piano. I've also noticed he's very sensitive. 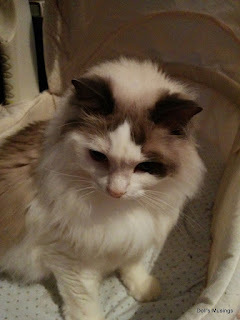 The other day I played some baroque music, a bit on the sad side, and his mouth turned down and tears started to flow! Oh my boy how he feels the music! When he hears other children crying, he cries too! Crazy how emotion affects children! Anywho, I hope I don't bore too many people with endless baby photos. I do have a few crafty photos to show though. 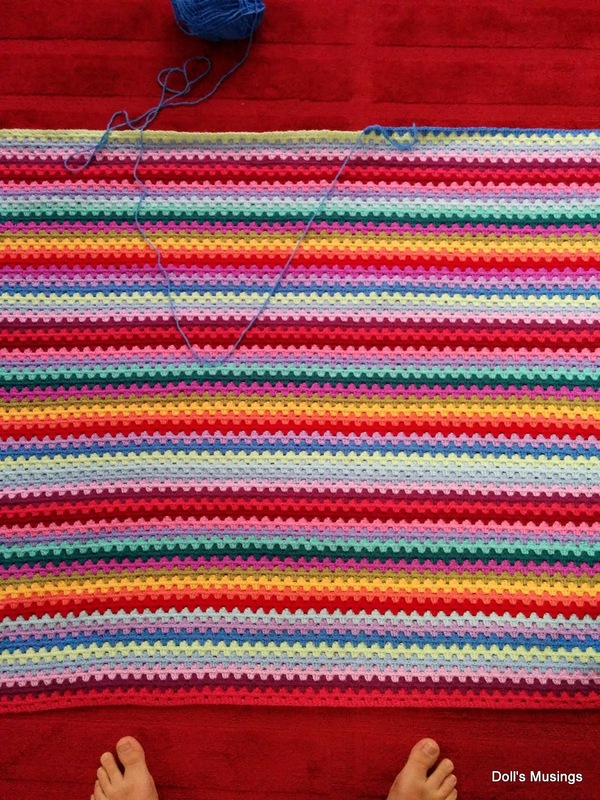 I am trying to finish my granny stripe blanket. Only 13 more rows to do then I can start the border. 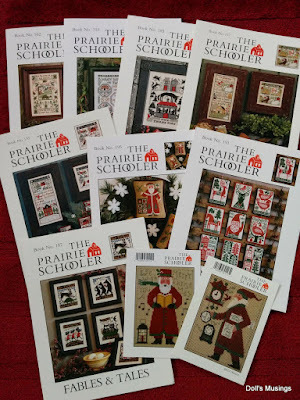 I also bought a pile of Prairie schooler charts as I know they are retiring this year and one can never have too many charts. Right?!!! 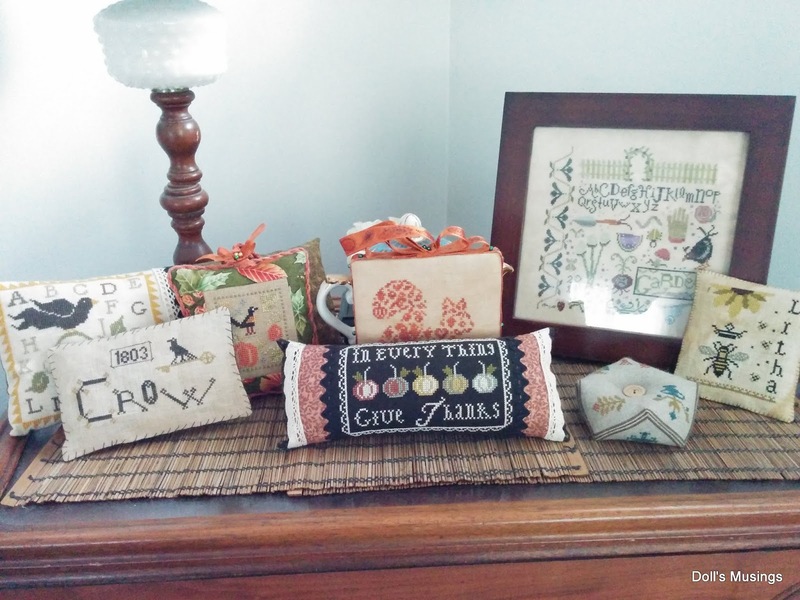 With an abrupt, horribly blustery, wind damaging end of summer this week, I pulled out my fall ornaments to say goodbye to a beautiful summer. I am halfway done on my Prairie Schooler Santa. I find the evenings are the best when he goes down for his first sleep which is usually anywhere between 2-3 hours. I also received some amazing baby gifts as of late. The lovely Noni from Fireflies and Cats in the Garden sent the most adorable Australian themed gifts. She cross stitched the most adorable Koala with Eucalyptus flower as a hat for Nathanael. Once we get a decent bookcase to shelve his growing collection of books, I'm going to put the frame above the bookcase. I adore the koala slippers she sent too!! 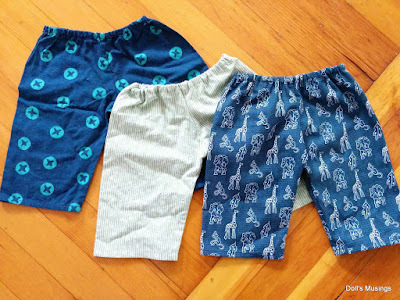 I met up with Melissa from Words and Blooms and she made Nathanael three adorable pairs of cotton pants! He looks very handsome in all three of his pants. Melissa has become quite the seamstress and she serged the pants impeccably! 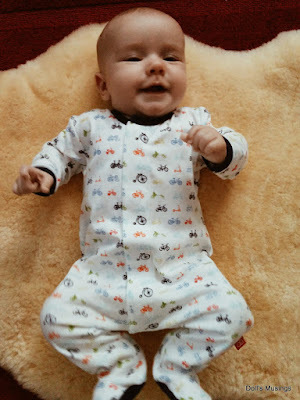 Okay, now onto a barrage of baby photos. Last but not least, little Titus sleeping in Nathanael's bassinet. Nathanael has graduated to his crib and for now the bassinet is Titus' new bed. 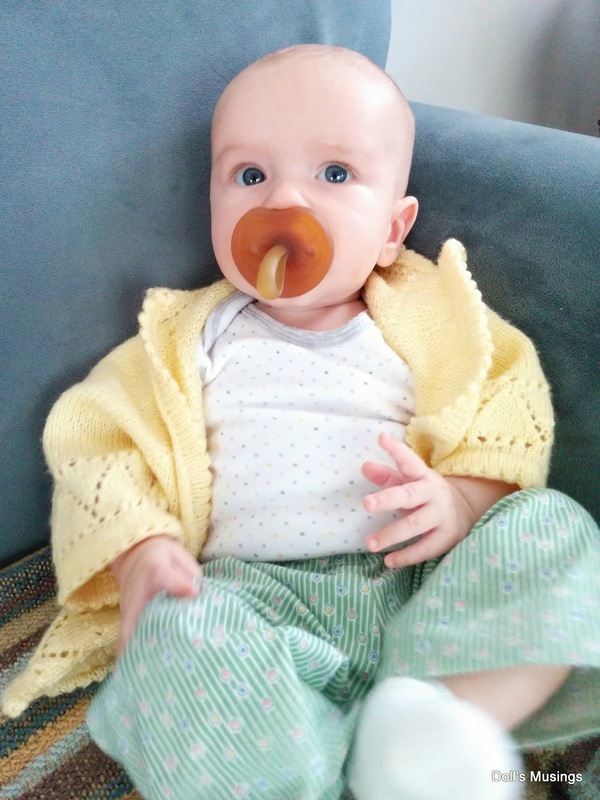 I hope you all enjoyed this baby filled post! I do feel a bit disconnected from all my bloggy friends. I will try to be a bit more connected in the future. I do read people's posts at night but I have difficulty writing comments from my phone. Your little family is beautiful! I am so glad all is well my friend. Oh Anne, I love seeing the baby photos. He is just adorable! So nice seeing his photos with all the different family members! Your Santa is coming along very nicely. It won''t be that long and he will be all excited about Santa! It is great to hear from you but I think we all know how very busy you are right now! You can never have too many baby pics!!! What a handsome little man you have. Enjoy every minute with him....they grow up too quickly. Your little baby is so sweet. Have a lovely weekend and enjoy your stitching! What a great post! I love that Titus has inherited Nathanael's bassinet! lol! I can see Titus loving that! Nathanael is so adorable! I can't believe he's already 3 months old! Wow! All the pics are lovely, and I love hearing your baby news too. Sounds to me like you might have a music genius on your hands if you ask me! Love your crochet blanket and your stitching too. Enjoy these days of Nathanael's baby-dom. They go so so fast. Such a wonderful post filled with family love. 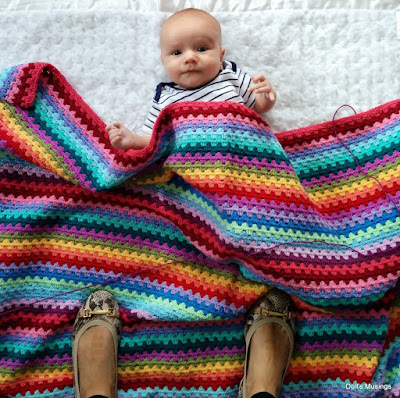 The blankie is growing well and its modelled so well by your little helper. 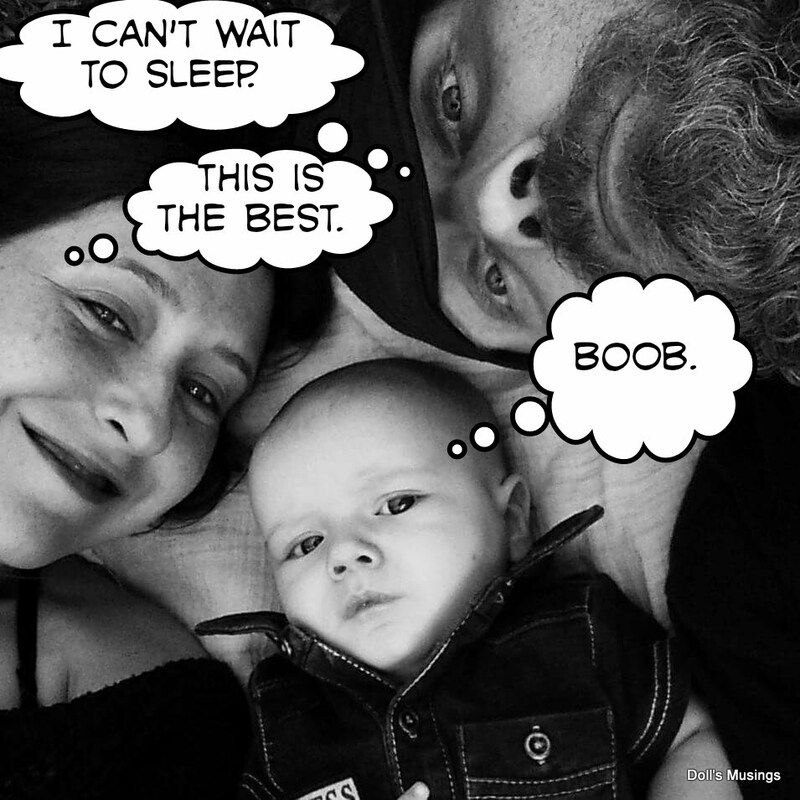 Looks like Mommy-hood agrees with the whole family! A ton of fun photos. 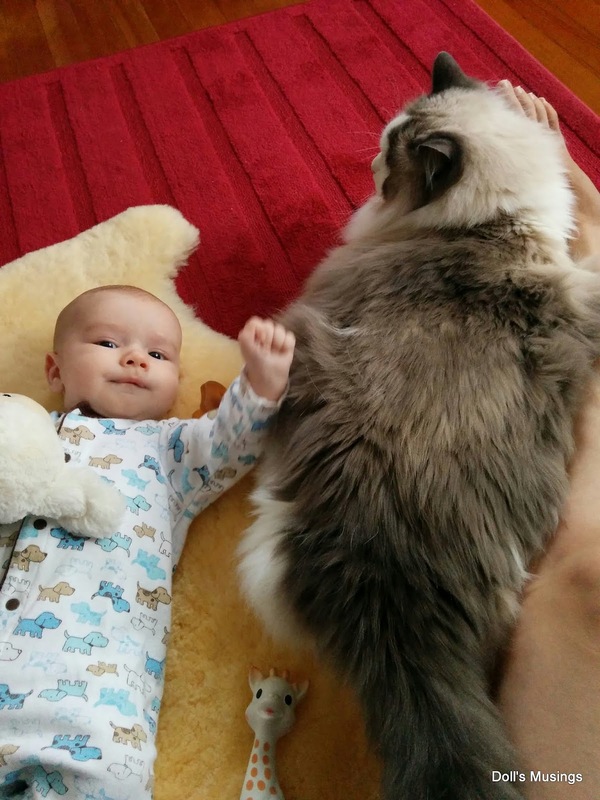 Is Nathaniel finally bigger than Titus? Anyway, he looks wonderful under your colorful blanket! What a handsome little one you have! What lovely gifts you have received for him. You afghan is look great along with your PS Santa. He really is the most adorable baby that I have ever seen outside of my own two LOL. Glad that you find some time for stitching too. It took me months to finish the last two inches of my older son's birth sampler once he was born! I'm glad you're finding some time to crochet and stitch--I remember how I always looked forward to nap time to just be able to go sit quietly and stitch away! 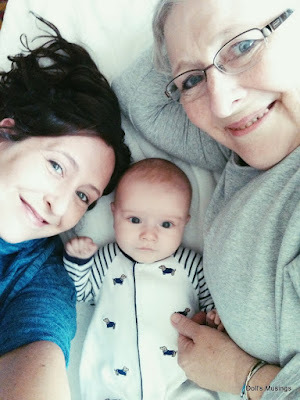 Thanks for sharing your gorgeous family photos, Nathanael is adorable! Beautiful big blue eyes and sounds like he is musical like you which is a lovely thing to share. Glad to hear you are finding time for yourself to stitch and crochet - it's so important to relax and find me-time even if it's snatched here and there. 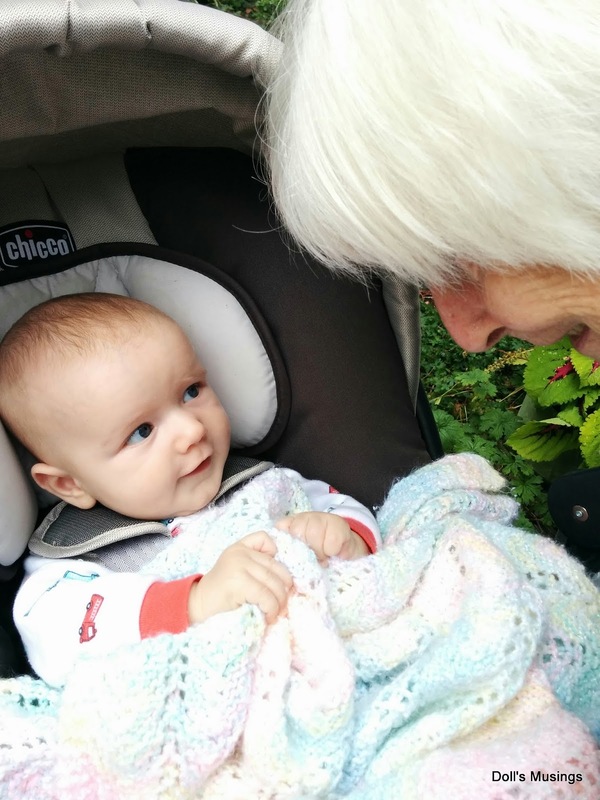 I especially love the photo of Nathanael and his great-Nana. They seem to be having a nice conversation! 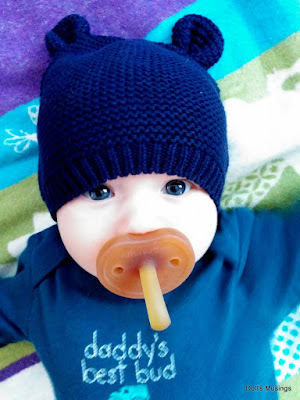 He is a sweet baby! I'm glad to see the pants fit but probably not for too much longer! The presents from Noni are wonderful. 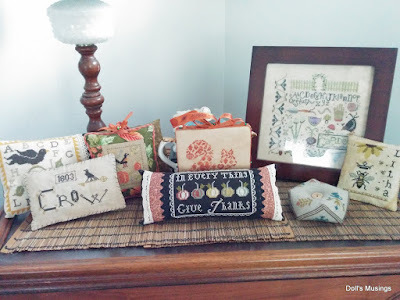 I see that you are keeping up with your stitching and crocheting as much as possible. You're doing great! I must say I am enjoying this fall weather (minus the storms). Spring came a month early for us this year, so I guess it makes sense that Autumn follows the same pattern! Nathanael is such a cute little guy!! I enjoy seeing the pictures!! You can keep them coming... even if there is no stitching to show! Lots of us have been through that and understand completely, and the others who have not... will have patience! Hugs! That little Nathanael is just the cutest thing! 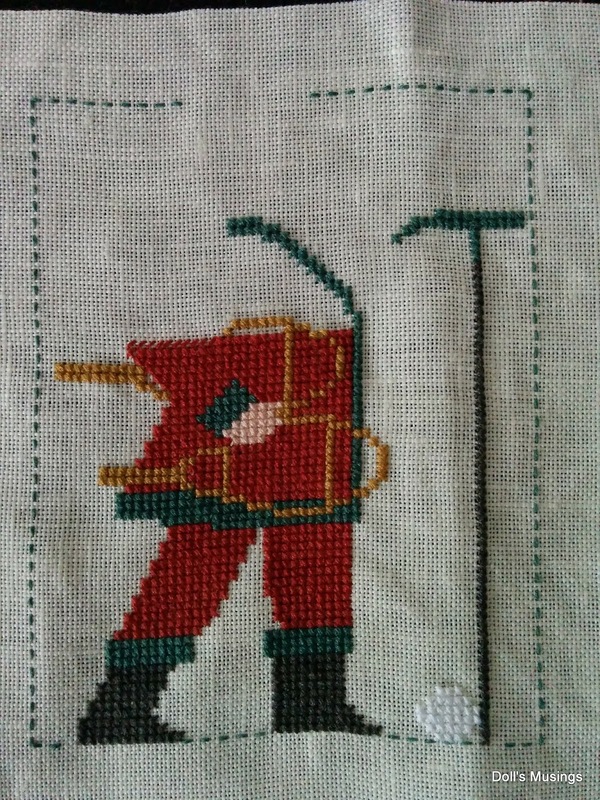 That you find the energy to stitch at all is amazing to me. I always fell asleep,when I tried to do anything for the first 6 months? Your PS Santa is coming along very nicely and that's a good stash purchase, too! Your blanket looks awesome. So bright and cheery and cozy! You're getting a LOT done! So many wonderful family and baby pictures, Anne. How could I ever get tired of them :) So nice to see Nathanel grow through your pictures. It's certainly not always easy to get some time for yourself, but you are doing great. Your little PS Santa is coming along great and so is your baby blanket. I am so pleased that you like the Aussie gifts! 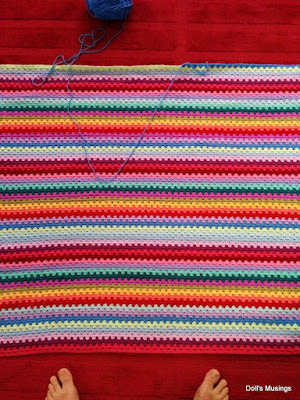 Your granny blanket is growing... so good to see that you getting a little bit of crafting done in between baby stuff! And that cutie=pie of you. I really love seeing his photpos. He is to adorable.. those cheeks.. the pictures are awesome. And also have time to craft!! your doing a great job. and your tablle of pieces is looking great!! keep it up, your doing a awesome job!! Such a wonderful post, Anne, so lovely to see your gorgeous family and your stitching and Granny stripe look wonderful!